“The citizens of the Salt Lake valley view the Great Salt Lake as a putrid, fly infested sump!” according to a 2002 National Geographic article about Utah. Love it or hate it, it's in our backyard so you might as well get to know it. It’s the fourth largest lake of its kind in the world, but the Great Salt Lake is often underappreciated in Utah. With the lake level within a foot or two of its record low, now is a good time to get to know the Great Salt Lake. Over 7 million migratory birds stop at the lake each year, stocking up for their epic journeys across continents. Between the people who come to appreciate the birds and a handful of specialized industries, the lake brings in over a billion dollars for the state each year. In this episode of The Source, we’ll hear from researchers and resource managers as well as residents and visitors to the Great Salt Lake. We’ll learn how close we are to actually losing the lake forever and some of the threats that are challenging it well beyond its usual ups and downs. Listen to the full program above, or in segments below. The Great Salt Lake (left) and its uncanny twin, Lake Urmia in Iran (right). Wayne Wurtsbaugh studies the Great Salt Lake in Utah, but he also studies its uncanny twin -- Lake Urmia in Iran, which he visited last year. Lake Urmia is now 10% of its natural size. 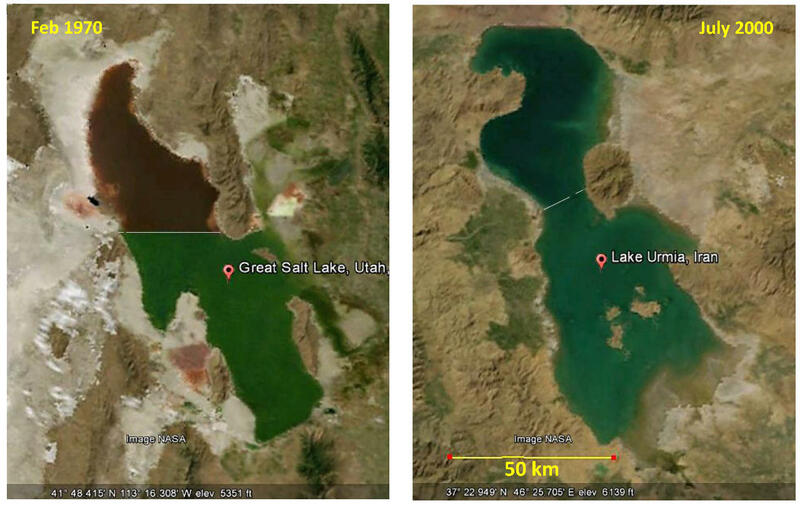 Iranian water managers want to learn what Great Salt Lake managers are doing right...and Utah wants to learn from what Lake Urmia managers are doing wrong. Part 3 - The Jetty's Out! Robert Smithson's work of land art - Spiral Jetty - attracts visitors to the remote north arm of the Great Salt Lake. After being underwater for the better part of 30 years, Utah's famous work of land art is on dry land. In our current drought, the Spiral Jetty on the shore of the Great Salt Lake is high and dry. Listeners of The Source tell their stories of venturing out to the north arm of the Great Salt Lake to either find the Jetty in a sea of pink or on a gleaming salt flat. Part 4 - Why is the North Arm of the Lake So Salty? Becauseway. Ross Chambless ventures out onto the railroad causeway that divides the Great Salt Lake in two. Built in 1959 the rock causeway isolated the north arm of the lake, cutting it off from freshwater source rivers and making it saltier and saltier. Brine circulation is key to the ecology of the lake, and the barrier has major implications on industries dependent on the delicate balance of salt. The Bear River Migratory Bird Refuge is where the Bear River enters the Great Salt Lake, providing 70% of the lake's freshwater. It’s hard to talk about the Great Salt Lake without talking about the Bear River, it’s largest freshwater source. The state has plans in place to develop the Bear River, which will greatly affect the lake level and salinity of the Great Salt Lake. Ross Chambless explores the river with documentarian Craig Denton, John Luft, the Great Salt Lake ecosystem program manager, and a swarm of brine flies. The Great Salt Lake is, right now, actually two lakes split in half by a long railroad causeway. A couple years ago the crumbling culverts that allowed flow between the north and south arms of the lake were closed for safety. Since then, scientists say, curious things are happening to the lake, especially as it approaches historic low levels. Inside every tree there’s enough information to keep researchers around the West busy for their entire careers. This week on the program, a look at dendroclimatology -- using tree rings to re-construct what the climate was like in Utah hundreds of years ago. Because looking at the state’s climate past is the best way to understand the future. Jennifer Pemberton talks to plant and climate scientists about how they interpret the thousands of tiny rings that make up a tree’s life history into a full picture of the cycles of wet and dry Utah has seen over the past thousand years.